We're back with another 'Kate Loves: Jewellery' post. Tonight we're focusing on necklaces, pendants and chains. From what we've seen thus far the Duchess tends to favour several pieces we've seen her bring back time and time again, however, there have been a couple of showstoppers we'll be looking at, too. After Kate graduated from St. Andrews University she took on a role as an accessories buyer for Junior Jigsaw. During this time she collaborated with talented jewellery designer Claudia Bradby who describes her pieces as 'Jewellery For Living'. The two combined their efforts and one of their designs was The Camellia Necklace, which mixes soft green amazonite with rose quartz. The long sterling silver hoop is versatile and very wearable, and was publicly worn by Kate on several occasions. It's interesting to note Kate's input in the design which very much reflected her taste in jewellery at the time. Kate enjoyed accessorising her pre-engagement looks with high street and affordable pieces including the £45 Lola Rose Medium Open Heart Necklace. 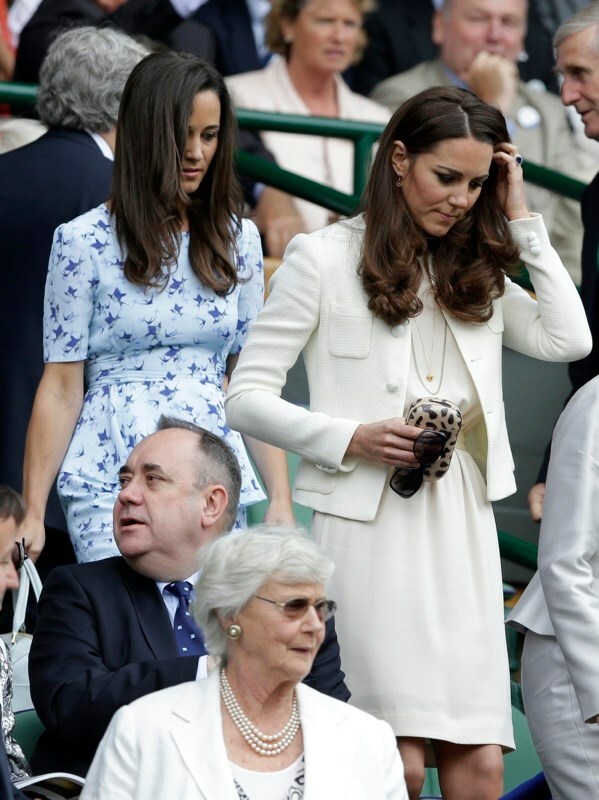 In July 2012, Kate and her sister Pippa supported British Number One Andy Murray at the Wimbledon final. The Duchess looked crisp in a white suit and accessorised with a Gold Plated Acorn Necklace by UK designer Kristin Magnusson. 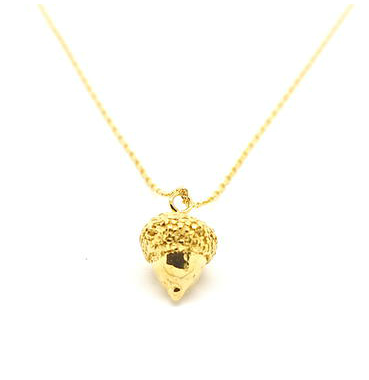 The acorn forms an integral part of the Middleton family crest; it is quite possible it may have been a gift. To complete the look the Duchess added a chain, thought to be a Cassandra Goad piece. From friends' weddings to royal tours, Kate's Asprey 167 Button Pendant is a versatile and classic piece which has served her well in recent years. Retailing for $3,750, the pendant has a central amethyst stone surrounded by pavé diamonds all set in 18ct gold. Kate's diamond cross pendant remains a UFO (Unidentified Fashion Object). It's been in her possession since at least 2005 when she wore it for the wedding of Hugh van Cutsem and Lady Rose Astor. The Duchess wore it to the Order of the Garter ceremony in 2011. During the Canada tour Kate wore a lovely gold disk necklace with three layers. In June 2012, Kate played host to 150 children from her patronage The Art Room at a performance of The Lion, the Witch and the Wardrobe in Kensington Gardens. Kate wore a vibrant blue Zara dress and accessorised with a chain bib necklace with black beads. There were a limited selection of photos available and we haven't had a detailed look at the piece yet, but from what we can see, I must say I do like it. It's a statement piece which works well with brighter hues. Moving on to those aforementioned showstoppers, beginning with Kate's Cartier Trinity Necklace. In her role as London 2012 ambassador Kate attended an exhibition at the National Portrait Gallery celebrating the road to the games. Undoubtedly, the design of the piece echoed the Olympic rings, however the whopping £49,000 price tag ignited quite the debate. Royal aides said the necklace was "from Her Royal Highness's own wardrobe and she thought it appropriate to wear given the Olympic theme". One would imagine it was a gift given the incredibly high price. Aside from the Olympics I cannot imagine Kate will get a vast amount of wear out of it. It doesn't seem a piece particularly suitable for royal engagements nor is does it have the versatility to work very well for evening looks. When we look back at Kate's style in years to come her appearance at the Sun Military Awards will remain a stand out in my opinion. The fitted black velvet McQueen gown looked beautiful on her not to mention the stunning jewels she chose. The dazzling ruby and diamond necklace and matching bracelet were a wedding gift from a friend. The necklace very much looks like it is convertible into a tiara, a look I do hope we see in the near future. It was the one and only time we've seen the Duchess draped in such magnificent jewels and she carried the look off with aplomb, looking every inch the Duchess. Fabulous, fabulous jewels. Whoever gifted them to Kate has superb taste, I think you'll agree. Last month Kate was photographed shopping at Zara wearing a new pendant which is thought to have been a gift to mark the birth of Prince George. If we look closely we can see a little boy figurine and gold discs. 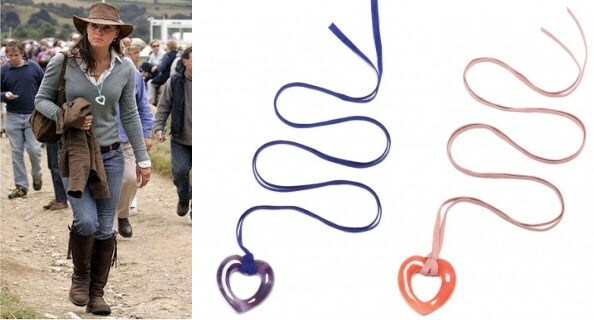 Finally, Kate was gifted garland necklaces made from shell money by locals in Marau. It will be interesting to see Kate's necklace collection grow in the future. Next, we'll be looking at Kate's bracelets, watches and rings before completing our Jewellery series with a prediction post (expect plenty of tiaras). What a fun post! I have always loved the Asprey 167 Button Pendant and as you mentioned, we have seen it many times. Also really loved the Cartier Trinity Necklace. Was the engagement at the National Portrait Gallery the only time Kate has worn it? Hoping to see it again! By far my all time favorite is the diamond and ruby necklace she wore to the Sun Military Awards. I remember thinking how incredibly gorgeous and every bit a princess when seeing video and pictures of her. I love how you worded it Charlotte as, "the Duchess draped in magnificent jewels". I agree that whomever gifted them to her has perfect taste! Absolutely stunning! Thanks for the post! Hope everyone had a great weekend! Charlotte thank you for another beautiful post. Kate has such gorgeous necklaces. Thank you so much. I love the unknown cross simple but beautiful. I wondered too if the ruby and diamond necklace could be converted into a tiara . It is beautiful. I respect her for not wearing jewelry but oh do I wish she would put on some bling. I can't help it. Haha. I really love the Septet pendant. Would love to find a cheaper version! That diamond and ruby necklace is absolutely gorgeous. But again, that was an occasion where she should have put up her hair. With a gown like that, and a fabulous statement necklace - she should have wanted to get her hair out of the way and show it off. Let's hope we get to see her in another evening gown soon! And yes, bring on the tiaras!! Wondering about the red shoes Kate was wearing from the Canada tour? Do we know what brand they are? Has she worn them more than once? Nice post, Charlotte, thank you! I adore Catherine's Asprey pendant, so charming! Even though I think you're right, she won't get much use from her Cartier necklace, I think it's a very beautiful piece! I love the way it shines! 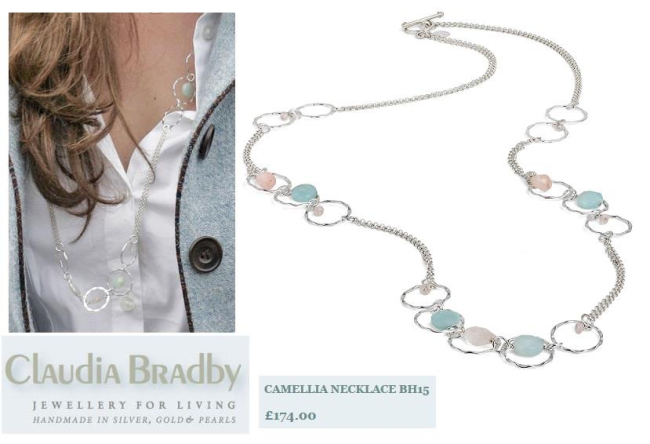 the gold disc necklace is my fav, next is the asprey necklace. love! Love the Olympics necklace -- anybody know of a good knockoff? Here's an off-topic question: For the Sun Military awards, Kate wore black. And this surprised me because I thought royals only wore black to funerals/Remembrance day. I remember Lady Di (before her wedding) wore a black dress to an event with Prince Charles and it was considered a major faux pas. However, I don't remember Kate getting any flak for wearing black. Has this rule been relaxed? I think you are talking about the engagement at Goldsmith's Hall in March 1981....her first official public outing since her engagement to Prince Charles. I don't think it was as much the color (black) as it was the very low neckline. It was a bit "revealing" for a Royal back in that time. I saw the dress on display summer 2012 at KP. It was beautiful! I know there were comparisons between Diana and Kate when Kate wore the McQueen dress, but I think it was also because of the similar neckline not the color. I have been looking for a repli-Kate since I first set eyes on that beautiful Cartier. For awhile, the closest necklace was the Double Circle Pendant Necklace by Judith Jack for $145. 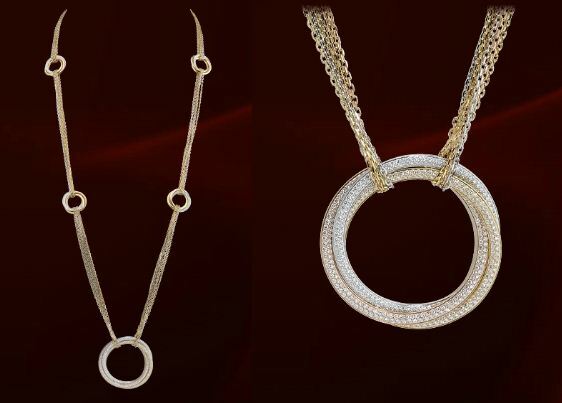 Fortunately, Nordstrom sells the Long Circle Pendant Necklace by Roberto Coin for $2,500. 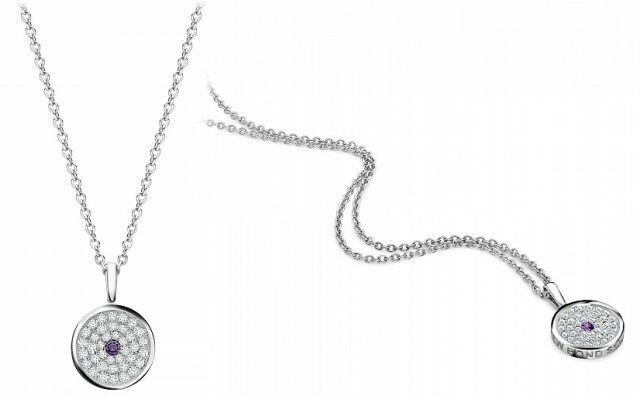 The closest item I could find to the Asprey necklace is the "Brilliance" Pave Disc Pendant Necklace by Michael Kors in Silver/Clear Crystal for $95. LOVE the jewelry posts. Amazing pieces and it is so good to see them discussed! Well done! Have you ruled out Tiffany as source of the diamond cross? Think they have similar pieces. Agree the black strapless gown and that exquisite necklace is a look the Duchess ought to recycle. I was going to suggest Tiffany. Elizabeth Hurley has one that looks like this and that's where she said hers is from. This is the most similar Tiffany cross with diamonds--but not quite right. 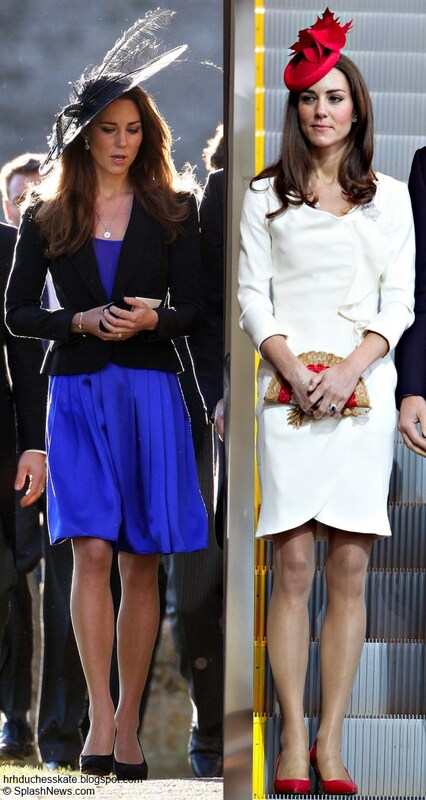 Have you ever thought that might be the Duchess's style. The Queen does not wear alot of jewerly, nor does Princess Ann nor does Sophie. Just because she is a Duchess does not mean she has to wear alot of jewerly. Love the Cartier trinity necklace - surely she would have occasions to wear it again. Really don't like the diamond and ruby piece from the sun military awards - didnt see any video footage of her wearing it but the photos make it look like a sparkly necklace for a little girl. I think it is the ruby flowers that make it look juvenile to me. Anyway, I'm sure it's lovely in real life - Kate has fine taste. I'd be interested to see what it would be like if it could be turned into a tiara. The black velvet McQueen with necklace has always been one of my favorite looks for Kate. I think the hair down actually works well with the more elaborate necklace and strapless gown. The recent ink Jenny Packham gown would have been another perfect backdrop for a beautiful necklace. I was a bit disappointed she didn't add one. I don't think Kate needs to be dripping in jewels, but sometimes, when the dress is right, I wish she would just go for it! Love the Camellia necklace. Wonder if it is still available?! Lovely post! Thank you. This is a question NOT about the Duchess, but about one of her necklaces. Is it common to wear a cross made out of precious jewels such as diamonds? (I am not a Christian and I have never seen one before.). The cross is a symbol of a kind of torture I thought, and signals pain and sacrifice. What does mean to transform it into a kind of luxury item? I do not mean to offend. I am just curious about something that seems so counter-intuitive. I am always surprised when I see bejeweled crosses. Traditionally, they are made of silver or gold, and they remind Christians of Christ's sacrifice--that he paid the ultimate price for us. Jewels are sometimes included in larger crosses for churches and cathedrals, but jeweled crosses as jewelry seem to have started when certain singers and rappers started wearing them as art/pop culture pieces (I could be wrong; someone else may have initiated it as a jewelry design, but celebrity is the most noticeable). I am not fond of these small jeweled crosses. To me, they always look out of place. I prefer the traditional gold cross as a necklace. The cross could be Tiffany, they make a similar one. Don't think the diamonds are out of place. My late father gave my late mother a diamond cross for their 60th which symbolized both the celeebration and the spiritual aspect of their marriage. The cross is a symbol of sacrifice but also triumph over death. a Roman degrading symbol made a powerful sign of salvation. In early art was often decorated with jewels. What a beautiful response! You are right. As you say, not only is the cross a symbol of sacrifice, but also one of triumph. A diamond cross is a very thoughtful gift for a 60th wedding anniversary! What a wonderful marriage your parents must've had--I hope to achieve the same one day. My parents have been married 34 years, so I have solid footsteps to follow. I have a feeling the ruby and diamond necklace does convert to a tiara and perhaps she was given other pieces to match it. Her hair looked lovely that night, but IMO a necklace like that calls for an up-do. She had a lot going on with the jewels, the long hair around it, and the ruffle trim on the gown. My second favorite piece is the Cartier Trinity necklace. It's sleek, modern and it looked terrific with her blue dress. I believe I've seen a similar necklace on Princess Mary. I loved that ink gown as well. I kept picturing in my mind Diana's sapphire and pearl choker. I also like her Cartier circle necklace. She has good taste. Great post Ms. Charlotte. I have a question on a necklace Kate wore just a little while back. She was out shopping and she had on a new necklace which had it looked like a little baby and maybe a baby shoe. Do you have information on that one. Also just was wondering if you have any more info in teh ring Kate wore to the 100 Hudge Fund Gala? Thanks again for all yuour hard work. Can't wait until tomorrows engagement Will & Kate. Do you have any information on the necklace Kate wore to meet the Obamas shortly after the wedding? Thanks for another informative post Charlotte! I really enjoy each and every one of them. I would say the gold disc, the acorn - because it has the Middleton family crest, and the Lola open heart necklace are my favorite. Kate certainly has a great taste in Jewellery and I love her necklace collection! In Diana's case, the problem wasn't the color of the gown!